Remember Ole Hairy, Finty? An interview beckons. FOR YEARS David Bellamy was one of the best known faces on TV. A respected botanist and the author of 35 books, he had presented around 400 programmes over the years and was appreciated by audiences for his boundless enthusiasm. 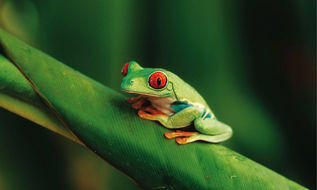 Yet for more than 10 years he has been out of the limelight, shunned by bosses at the BBC where he made his name, as well as fellow scientists and environmentalists. His crime? Bellamy says he doesn’t believe in man-made global warming. Here he reveals why – and the price he has paid for not toeing the orthodox line on climate change. "When I first stuck my head above the parapet to say I didn’t believe what we were being told about global warming I had no idea what the consequences would be. The truth is, I didn’t think wind farms were an effective means of alternative energy so I said so. Back then, at the BBC you had to toe the line and I wasn’t doing that. At that point I was still making loads of television programmes and I was enjoying it greatly. Then I suddenly found I was sending in ideas for TV shows and they weren’t getting taken up. I’ve asked around about why I’ve been ignored but I found that people didn’t get back to me. I’ve seen evidence, which I believe, that says there has not been a rise in global temperature since 1998, despite the increase in carbon dioxide being pumped into the atmosphere. This makes me think the global warmers are telling lies – carbon dioxide is not the driver. The idiot fringe have accused me of being like a Holocaust denier, which is ludicrous. Climate change is all about cycles, it’s a natural thing and has always happened. When the Romans lived in Britain they were growing very good red grapes and making wine on the borders of Scotland. It was evidently a lot warmer. If you were sitting next to me 10,000 years ago we’d be under ice. So thank God for global warming for ending that ice age; we wouldn’t be here otherwise. People such as former American Vice-President Al Gore say that millions of us will die because of global warming – which I think is a pretty stupid thing to say if you’ve got no proof. And my opinion is that there is absolutely no proof that carbon dioxide is anything to do with any impending catastrophe. The ­science has, quite simply, gone awry. In fact, it’s not even science any more, it’s anti-science. There’s no proof, it’s just projections and if you look at the models people such as Gore use, you can see they cherry pick the ones that support their beliefs. To date, the way the so-called Greens and the BBC, the Royal Society and even our political parties have handled this smacks of McCarthyism at its worst. Global warming is part of a natural cycle and there’s nothing we can actually do to stop these cycles. The world is now facing spending a vast amount of money in tax to try to solve a problem that doesn’t actually exist. And how were we convinced that this problem exists, even though all the evidence from measurements goes against the fact? God knows. Yes, the lakes in Africa are drying up. But that’s not global warming. They’re drying up for the very ­simple reason that most of them have dams around them. So the water that used to be used by local people is now used in the production of cut flowers and veget­ables for the supermarkets of Europe. 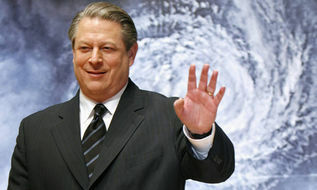 One of Al Gore’s biggest clangers was saying that the Aral Sea in Uzbekistan was drying up because of global warming. Well, everyone knows, because it was all over the news 20 years ago, that the Russians were growing cotton there at the time and that for every ton of cotton you produce you use a vast amount of water. The thing that annoys me most is that there are genuine environmental problems that desperately require attention. I’m still an environmentalist, I’m still a Green and I’m still campaigning to stop the destruction of the biodiversity of the world. But money will be wasted on trying to solve this global warming “problem” that I would much rather was used for looking after the people of the world. Being ignored by the likes of the BBC does not really bother me, not when there are much bigger problems at stake. I might not be on TV any more but I still go around the world campaigning about these important issues. For example, we must stop the dest­ruc­tion of trop­ical rainforests, something I’ve been saying for 35 years. Mother nature will balance things out but not if we interfere by destroying rainforests and overfishing the seas. That is where the real environmental catastrophe could occur. The earth may be considered as an electrically charged body in dynamic electrical equilibrium with the plasma of its immediate environment, space. The earth is electrically isolated from its plasma environment by a space charge sheaf, or plasma double layer within which the total voltage difference occurs. However an isolated body whose electrical potential is not continually renewed by electric currents will quickly acquire the potential of the surrounding plasma and its double layer will disappear. These electric currents have to pass through the interior of the earth, which passing through matter, generate heat. Just how this is achieved within the upper mantle remains to be resolved, and through which paths, but we can be equally certain of one fact, radiogenic decay cannot be invoked as the heat source since it diminishes over time, and is thus incapable of producing any thermal surge in order to explain periodic volcanism observed during the Earth's evolution. (Plate Tectonics is essentially a myth whose death throes can be viewed at the NCGT website). Radiogenic heat implies a an Earth cooling with time, not one which exhibits a fluctuating thermal state as observed over history. The earth's thermal stability is dominated by its mass and the only plausible energy source for maintaining its thermal state are the electrical currents connecting it with the sun, with a minor diurnal variation from solar radiance. The Sun's source of energy is external and as, like the earth, the solar double layers also have to have electric currents maintaining its electric state; these electric currents come from the galaxy. It has recently been discovered that the Sun's heliopause has shrunk some 25% in diameter, and this spherical layer could be considered the outer layer of the Sun's double layer, insulating it electrically from the rest of space, then a reduction in the diameter of the solar double layer would imply a reduction in the electric currents feeding the Sun itself. This effect would be noticed by an absence of solar sunspots whose characteristics were modelled by Kristian Birkeland in his Terella experiments. If the electrical power to the sun is reduced, then so too the electrical power to the earth, and hence the present day observed cooling of the earth's global mean temperature. (There is a widely maintained myth that the earth's thermal stability can be affected by the burning of hydrocarbons by humanity on its surface. This belief is known as Anthropogenic Global Warming and is pure bunkum and not considered here as a serious scientific idea. It is, however, an extremely serious political idea, and needs to dealt with the strongest measures). Now an interesting physical fact lies in the Giauque-Debye adiabatic demagnetization phenomenon where a sudden collapse in the magnitude of a magnetic field causes cooling. But any collapsing magnetic field has to be preceded by a collapsing electrical current, and this fact raises the possibility that Earth Ice Ages, and for that matter minor ice ages like the LIA, might be the result of a signficiant decrease in the power of the electrical currents to the earth. As any one who has any experience with electric heaters, turning off the electrical power to the electric heater causes it to cool. So why should the earth system behave any differently? Climate science is struggling for an energy source to replace the widely assumed Solar Irradiance model. The one suggested here, based on the principles of a plasma universe, seems a better solution. It, at least, explains the observations which AGW cannot. "flux transfer event"--with a spacecraft on hand to measure particles and fields. Sept. 23, 2008: In a briefing today at NASA headquarters, solar physicists announced that the solar wind is losing power. "The average pressure of the solar wind has dropped more than 20% since the mid-1990s," says Dave McComas of the Southwest Research Institute in San Antonio, Texas. "This is the weakest it's been since we began monitoring solar wind almost 50 years ago." 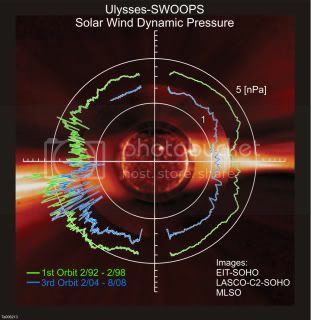 Global measurements of solar wind pressure by Ulysses. curves denote lower pressure winds in 2004-2008. Curiously, the speed of the million mph solar wind hasn't decreased much—only 3%. The change in pressure comes mainly from reductions in temperature and density. The solar wind is 13% cooler and 20% less dense. "What we're seeing is a long term trend, a steady decrease in pressure that began sometime in the mid-1990s," explains Arik Posner, NASA's Ulysses Program Scientist in Washington DC. How unusual is this event? "It's hard to say. We've only been monitoring solar wind since the early years of the Space Age—from the early 60s to the present," says Posner. "Over that period of time, it's unique. How the event stands out over centuries or millennia, however, is anybody's guess. We don't have data going back that far." Flagging solar wind has repercussions across the entire solar system—beginning with the heliosphere. The heliosphere is a bubble of magnetism springing from the sun and inflated to colossal proportions by the solar wind. Every planet from Mercury to Pluto and beyond is inside it. The heliosphere is our solar system's first line of defense against galactic cosmic rays. High-energy particles from black holes and supernovas try to enter the solar system, but most are deflected by the heliosphere's magnetic fields. The heliosphere. Click to view a larger image showing the rest of the bubble. "The solar wind isn't inflating the heliosphere as much as it used to," says McComas. "That means less shielding against cosmic rays." In addition to weakened solar wind, "Ulysses also finds that the sun's underlying magnetic field has weakened by more than 30% since the mid-1990s," says Posner. "This reduces natural shielding even more." Unpublished Ulysses cosmic ray data show that, indeed, high energy (GeV) electrons, a minor but telltale component of cosmic rays around Earth, have jumped in number by about 20%. These extra particles pose no threat to people on Earth's surface. Our thick atmosphere and planetary magnetic field provide additional layers of protection that keep us safe. But any extra cosmic rays can have consequences. If the trend continues, astronauts on the Moon or en route to Mars would get a higher dose of space radiation. Robotic space probes and satellites in high Earth orbit face an increased risk of instrument malfunctions and reboots due to cosmic ray strikes. Also, there are controversial studies linking cosmic ray fluxes to cloudiness and climate change on Earth. That link may be tested in the years ahead. Some of most dramatic effects of the phenomenon may be felt by NASA's two Voyager spacecraft. After traveling outward for 30+ years, the two probes are now at the edge of the heliosphere. With the heliosphere shrinking, the Voyagers may soon find themselves on the outside looking in, thrust into interstellar space long before anyone expected. No spacecraft has ever been outside the heliosphere before and no one knows what the Voyagers may find there. NASA is about to launch a new spacecraft named IBEX (short for Interstellar Boundary Explorer) that can monitor the dimensions of the heliosphere without actually traveling to the edge of the solar system. IBEX may actually be able to "see" the heliosphere shrinking and anticipate the Voyager's exit. Moreover, IBEX will reveal how our solar system's cosmic ray shield reacts to changes in solar wind. "The potential for discovery," says McComas, "is breathtaking." find renewed impetus to say "screw it!" And that's the new bottom line. violent storms exact a widening human and financial toll. is barely on the agenda. In its place: the financial crisis. "The interest and focus on climate change has dissipated somewhat,"
said Woo Yuen Pau, CEO of the Asia Pacific Foundation of Canada. agreement to improve energy efficiency and increase forest cover. beginning with a dinner Friday, are rock-bottom. survey of regional government officials, business people and academics. Last year, it was No. 4.
plans to promote efforts to combat global warming. leadership on health care issues. President-elect Barack Obama, in strongly-worded remarks to a gathering of governors and foreign officials on Tuesday, said he had no intention of softening or delaying his aggressive targets for reducing emissions that cause the warming of the planet. “My presidency will mark a new chapter in America’s leadership on climate change that will strengthen our security and create millions of new jobs in the process,” Mr. Obama said. State officials and environmental advocates were cheered that Mr. Obama choose to address climate change as only the second major policy area he has discussed as president-elect. In a press conference and television interview last week he said that his first priority as president will be to revitalize the economy. The bipartisan summit meeting was convened by Arnold Schwarzenegger, the Republican governor of California, who has been a leader in state efforts to regulate greenhouse gases, even when it meant confronting the Bush administration over its more hesitant approach. Attendees included the governors of Illinois, Florida, Wisconsin and Kansas, who have also been in the forefront of actions at the state level to act in the absence of a national climate change plan. Officials from 22 other states, Mexico, Canada, Australia, Brazil, China, India and Indonesia, as well as United Nations aides and environmentalists, also are taking part in the two-day meeting. Mr. Schwarzenegger announced the meeting in September in part to signal to Washington and the two presidential candidates that the states were serious about moving forward with climate legislation with or without Washington’s blessing. California enacted a sweeping climate bill in 2007 that would have, among other things, imposed strict mileage and emissions standards on all cars and trucks sold in the state. More than a dozen other states adopted the standards, but they were struck down by the Bush administration last December on the ground that the states did not have the legal authority to regulate greenhouse gases. Mr. Obama said that although he would not attend a U.N.-sponsored meeting on climate change next month, he has asked members of Congress who are going to report back to him on what the United States can do to reassert leadership on global climate policy. Governor Jim Doyle, Democrat of Wisconsin, said in a telephone interview from Los Angeles that he had been frustrated by what he said was the Bush administration’s timid approach to climate issues. And he said that despite the current economic crisis, it was important to begin long-term efforts to address global warming. According to Horner, there is talk that Barack Obama will attempt to get a climate change treaty ratified by simply reclassifying the necessary legislation as an ‘executive agreement’, making passage through the Senate considerably easier. That would be at odds with the spirit of the American Constitution, which demands the Senate’s ‘advice and consent’ on major treaties (1). in support of the global warming hysteria. Well, let's call it retrospective readjustment based on GISS re-analysis. Think of it this way. You conduct an experiment. this out AFTER you have been running the experiment for many years. over different time periods at different locations. with great accuracy and any uncertainties are minimal. Now here's another danger of the use of pretty graphics. I mean - just look at the steep rise in that graph. Temperature looks like it's going through the roof! Now that doesn't look quite so alarming, does it? Yet both graphs are showing essentially the same data range. So appearances can be, and often deliberately are deceptive. But there's another deception inbuilt into both graphs. They are graphs of Earth's surface temperature, isn't that right? ever recorded --to the higest surface temperature ever recorded. That's fair enough, isn't it? minus 89 degrees celcius at Vostok, Antarctica - July 21, 1983.
plus 58 degrees celcius at Al 'Aziziyah, Libya - September 13, 1922.
planet are only hurting the poor. for Al Gore what Michael Moore's Fahrenheit 9/11 did for George W Bush. Ledger's Joker from the latest Batman film. controversial. And Al Gore and Hollywood may well not want you to see it. And in that respect, Gore and co are actually succeeding for the moment. Because there is no completed film. Not yet anyway. total of $4.5m to allow for a full cinema release. 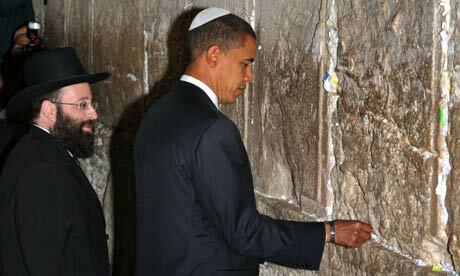 of Barack Obama. The finished product will be around 90 minutes long. category at the Amsterdam Film Festival later this month. now believe that political options to fight "global warming"
These lunatics just got really dangerous! curbing emissions may become necessary. reduce sunlight levels by man-made means or take CO2 out of the air. least until deep cuts are made in CO2 emissions. less efficient at absorbing man-made CO2 from the atmosphere. implementation of a worldwide geoengineering strategy. did not know whether a geoengineering strategy is needed or not. control and there an urgent need to cool the planet quickly. Oceanography Centre at Southampton University. cent felt about the same. optimistic now about prospect of curbing CO2 compared to 10 years ago. in parallel with other measures to curb CO2 emissions." geophysicist at Chicago University and expert on ocean chemistry. change within a very short time." chairman of the Environment Agency. Mr Gummer said last night he knew nothing about the vacant post. Could technology help save the world? side-effects such as acid rain and adverse effects on agriculture. would only affect the oceans, but still lower global temperatures. of phytoplankton – tiny marine plants – is the lack of iron salts in the sea. eaten by animals so carbon returns to the atmosphere as CO2. locked away in the deep ocean to the surface. giant mirror or a fleet of small mirrors between the Earth and the Sun. The scheme would be costly and prompt debate over who controls it.